The "Pilot" episode of No Tomorrow introduces us to Tori Anderson as a middle-management quality control officer for a shipping company. 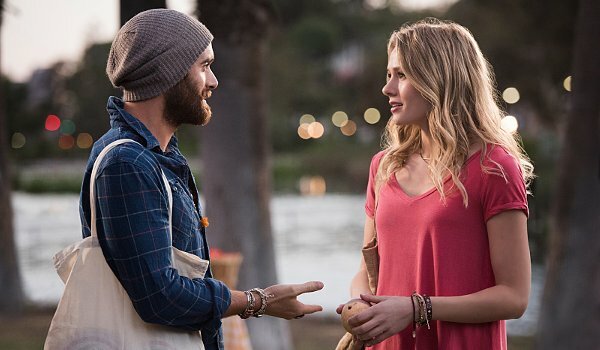 Safe but bored with nearly every part of her life, Tori's world is turned upside down by meeting Xavier (Joshua Sasse) who has taking the idea of Carpe Diem quite literally after discovering the world will end in just over 8 months. While not accepting Xavier's theory about a killer asteroid on its way to Earth, Evie (Anderson) can't help but be drawn to the man who brings out a reckless and adventurous side which she didn't even realize she had. The "Pilot" episode works largely on the charisma of its two leads. While I'd rather be seeing Sasse still gallivanting around. I don't ever quite buy Anderson as mousy as Evie needs to be in this episode, but she does have good chemistry with her co-star. The rest of the cast, including Evie's evil boss, co-workers, family, and fiance with one ridiculous (and inconsistent) characteristic, are all mostly forgettable. If the show has a chance it's going to have to be on Evie and Xavier's antics while seizing the day in (hopefully) entertaining ways week after week.